From here on, we study feature selection for classification. 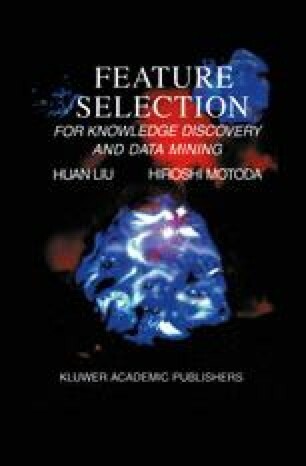 By choosing this type of feature selection, we can focus on many common perspectives of feature selection, obtain a deep understanding of basic issues of feature selection, appreciate many different methods of feature selection, and later in the book move on to topics related to feature selection. The problem of feature selection can be examined in many perspectives. The four major ones are (1) how to search for the “best” features? (2) what should be used to determine best features, or what are the criteria for evaluation? (3) how should new features be generated for selection, adding or deleting one feature to the existing subset or changing a subset of features? (That is, feature generation is conducted sequentially or in parallel.) and (4) how applications determine feature selection? Applications have different requirements in terms of computational time, results, etc. For instance, the focus of machine learning (Dietterich, 1997) differs from that of data mining (Fayyad et al., 1996).